The Western media has painted Mikhail Khodorkovsky as a brilliant businessman and model democrat, but is that really the case? I came across Mikhail Borisovich Khodorkovsky several times from the late 1980s to the late 1990s. It strikes me odd to see this Komsomol-bred apparatchik suddenly acquire a reputation as a successful businessman and a model democrat in the West. After all, Khodorkovsky’s bank, Menatep, was co-owned by the General Department of the Secretariat of the Communist Party of the Soviet Union’s Central Committee at least on paper until 1994—when I saw the share register of Menatep—and it was close to collapse by 1997. The transformation of Khodorkovsky’s image happened almost overnight sometime between October 2003 and February 2004, and it came as a surprise to the majority of the professional Russia-watchers and the banking community. Until this time, Khodorkovsky’s image was very far from that of a leading Russian businessman and a prominent public figure. His negative image had started to reflect on his business—potential industry investors pulled out of their negotiations with Yukos and the company had to drop its plans for an international IPO shortly after Lukoil set the industry standard in 2002. It seems also strange that Yukos itself is currently being portrayed as a successful company under Khodorkovsky’s management. 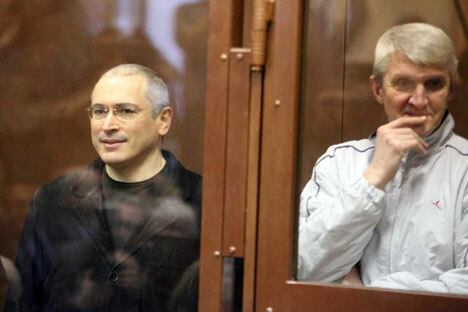 Khodorkovsky was practically given Yukos in the infamous 1997 loans-for-shares scheme. The Russian Central Bank lent money to Menatep, which used the proceeds to buy shares in Yukos. In comparison with other major Russian oil companies, Yukos was far from a runaway success between 1997 and 2003. Yukos chose a profit-driven growth model, which resulted in a very limited expansion into regions outside its historic production base. Yukos acquired only five new subsidiaries in Russia during that time, in comparision with Lukoil’s 33. While Lukoil invested heavily in switching its profit center from margins on trading in crude to added value in oil products and downstream distribution, Yukos used every trick in the book to boost production from its existing wells. Yukos bought only one downstream asset outside of Russia (the Mazheikiai Refinery), while Lukoil bought three (Petrotel, Odessa and Burgas). Thus, Yukos was developed as a cash-generating center that financed Khodorkovsky’s other businesses and projects. As such, it was doomed to follow Atlantic Richfield's path rather than BP's or Shell's. The Yukos business model is typical of Komsomol businessmen—the purchase of a cash cow to finance fantasies and startup projects. This strategy also caused concerns of the Ministry of Natural Resources early on; the first investigations (and resultant fines) of compliance with terms of Yukos production licenses date back to 1998. It is not my task to give a detailed critique of Yukos under Khodorkovsky; I only mention these issues since they were not widely covered in the press and the real history of Yukos’ performance was not what is now widely portrayed in the West. One of the questions I have never seen even asked by numerous commentators is why Khodorkovsky was given Yukos? The answer to this question is very simple—Khodorkovsky was managing money entrusted to him by the Communist Party of the Soviet Union without any obvious success and needed a way to cover the losses accrued in Menatep by mid 1997. When Vladimir Putin became president and realized that the treasury was empty he turned to the elders who were looking after the Communist Party’s money that had been given to "trusted persons" for management. His task seemed to be to get that money back into the state coffers. It is obvious from the publicly available sequence of events (and sometimes excessively emotional exchanges between Putin and Khodorkovsky) that Khodorkovsky refused to return the money. A very vain and ambitious Sergei Bogdanchikov saw an opportunity and persuaded Igor Sechin to support him in the destruction of Yukos. The rest, as they say, is history. It would seem that the Khodorkovsky "myth" is being distorted at least in two major respects: His relationship with the establishment that, on close scrutiny, was that of an insider, rather than an independent player; and his business management model, which was a variation of the old Soviet system of developing a facade at the expense of the real business.